A fun and educational book with attention grabbing illustrations for younger children and easy to read text for older ones. The book’s focus is on listening to parents and the consequences of not doing so. It also deals with a parent’s love and concern for their children. Joy Liebl was born and raised in Milwaukee, WI. She spent 5 years living in Elmhurst, IL before settling in Winter Park and then Safety Harbor, FL. Joy loves to crochet, do needlepoint & embroidery, sketch and work with dollhouse miniatures which she sells in her Etsy Shop “JoysHandmades” along with her crocheted pieces and varied vintage items. She is an avid reader but enjoys “Fantasy” the most. This is her first published book. 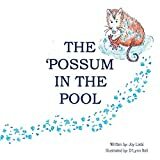 The story line is based on a true life experience of finding a small baby possum in her pool one morning and expanding her mind to create what she felt happened before and after the poor possum fell into the pool. Joy designed every bit of the book herself as to how each page must be set up to maximize the story. She was thrilled with D’Lynn Roll’s vision of how Robby would look and with each picture subsequently done. This book will surely be one of the first choices for children reaching to their bookshelf grabbing it – wanting to be told it again – and again. This is a book with a lesson to be learned; and does a great job at both entertaining while educating children. Liebl has created a cautionary tale by expressing a mother’s concern over her children, be it human or animal. The author’s book is a fun and educational way to teach children to follow directions, listen to adults, and recognize the dangers of not obeying rules.